It had not. I headed over. The doors at Purlescence are locked now but lots of work was going on on the other side as the place was slowly being emptied of its ten years. Kaye carried the thing to my car for me and, almost there, threw in the thought of, You wouldn’t be interested in a toaster oven? YES! I exclaimed a little harder than quite entirely reasonable, surprising myself. I had long wanted to be able to warm up just a bit of the kitchen for some small baked thing, but not enough to justify replacing my elderly cracked-plastic simple two-slicer. We don’t have a lot of countertop space. I had not wanted to want one and it all kind of came out in that one-word blurt. She apologized that it needed cleaning, but I found when I got home that it needed very little. It’s cute. It’s a two-bagel-slice top with a pull-down door in front and not much more of a footprint than my old toaster, a total win. But the biggest thing about the both of them is the bit of history she offered with them: all those Thursday nights, all those knit nights, they’d had these tucked away upstairs for a quick bite to eat. So that’s how they’d made it through all those long days over all those years. These appliances had sustained my friends so that they could sustain our knitting community and now I get to have them here with me. And someone else got to take home part of that history too, and I like that. I like it a lot. And I love that I now have a toaster oven that kind of looks like an old jukebox. I need to go toast me some toast. Anyone got a favorite slow cooker recipe? Chicken tikka masala, maybe? Every now and then, even the online mapmaker folks goof. Don’t know if you’ve encountered it but I have a couple of times. Like the time I was trying to meet up with an old college roommate and finally pulled over and called her. The map said this road connected up with that. Turns out that the one stopped a block shy–you had to go around this other way. So. I used to on rare occasion go to Green Planet Yarns when they were in downtown Campbell, but parking there was always horrible, and Purlescence was closer and easier all around, so, eh. I did like the owner, though, even if I didn’t know her very well, and she stocked some nice stuff. And then Green Planet moved to San Jose. I tried. A year ago I spent an hour wandering around on (turns out) the wrong side of the freeway, pulling over several times to check my phone to see what it was saying now, since I couldn’t hear it. Finally I gave up in frustration and headed home. I joked with Kathryn’s husband at Cottage Yarns a few days ago when I went to show her the Mecha afghan that I’d be back in two weeks (again) with the next one in Rios, but after all that color intensity, when I actually sat down to knit my eyes said no. I actually finally wanted to knit up some vanilla dk weight cashmere/silk I’d bought from Colourmart a few months ago: I wanted plain ordinary white and I wanted to knit that warm, soft yarn, even if it would need small needles and even if superwash merino might be far, far more practical. I’d bought this because I wanted to make this, so, so there. Grab the impulse while you’ve got it and go. My circular 5s were 24″ long. Wait–how, after all these years, could I not have…! Surely I do in some forgotten bag somewhere, but oh well. My 231 stitches were packed in so densely that it was a constant fight to push them along or out of the way. My hands never got to relax nor could my eyes see the pattern coming to be. There was only one thing for it. I knew who would have the brand needle I wanted. Yay for repaired maps: this time I found them. There was not a soul I knew in sight. That felt strange. But the clerk was friendly, and I bought a skein of supersoft thick wool in the most perfect purple, a semi-instant cowl-to-be. The color won. She offered to wind it up for me. And not only did they have my needle–they were closing it out. They had one last rosewood 40″ size US 5, and it was on sale and it was perfect and I got exactly what I’d come for. And a 40″ US 4, too, because. Re the yarn: Sure, thanks! Which means I had a moment to just stand around, or…. There were two knitters at the table. They invited me to join them and then included me in on the conversation as if I were just as much old friends with them as they were. They told me when they’d be hanging out and that they’d love to see me around again. I think my transition to Purlescencelessness just eased a bit. A close-up including of one of the dark spots at the center. I think the variegated-purples skein at the end was a bit too much purple, although it was a good transition from the red (and I needed the extra length and I knew Kathryn didn’t have a second bag of Anniversario in that weight.) The mostly-red skein was definitely a sharp transition from the green-purple–maybe I should have alternated pairs of rows of those two for awhile. 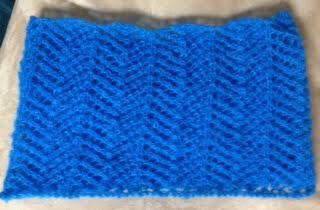 But then not a single skein matched another one anyway so why change how I’m doing it now, I kept figuring. I like the purl side better because of the way the purl bump colors play with their mates, definitely a different effect from the front (see the in-progress photo at the top). All along my eyes have proclaimed this my Northern Lights project because what else could this be? And if I were really good I’d knit the fern lace motif again for one more purple skein, unravel the afghan’s cast on, and kitchener the two pieces together to have the ends matching. Some notes on the yarn: I was trying to arrange the skeins in a symmetrical pattern going across as much as possible. I found the early skeins just slightly muted compared to the others, but for what I was trying to represent that’s fine. Definitely a fun afghan to curl up with. And warm. Not sure I’d do it again exactly like this one but I’m glad I did it. I read that email, scrolling past the dolphin photo, inwardly pleading, NO. Oh please no! I put my carry-around cowl project in my purse and headed over to Purlescence. Sandi and Kaye were both there and we exchanged grief and thanks and hugs and memories of the good that had been. But it came down to this: over the last ten years they had taught many how to knit, to crochet, to spin and to weave, and they knew some of those would continue to teach others. But they themselves had had very little time to make anything–they both described crafting at 4 am because the imperative to create felt so strong and had been kept in check for so long. And so they decided to retire, and Purlescence will close for good August 28th. I’m happy for them. I’m very sorry for all the rest of us. I’m glad we got to have that community gathering place as long as we did–and the wait for Stitches next February just got much much longer. I had a serious dearth of superwash merino around here. In the store the purple looked like it would make a good foil to the multi-color, and so I got them home and dove in. In swatching, the two-yarn lattice pattern I was going to do went out the window: Mecha seemed too thick to pull that off well. 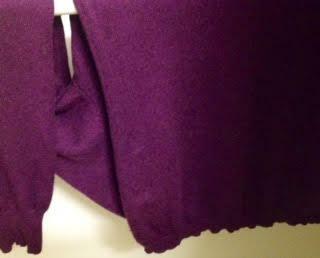 How about framed in purple on four outer edges. I’ve knitted nearly the entire first skein already. 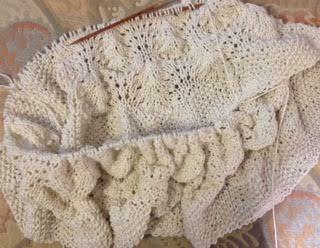 Now that the lower border is done and it’s time to switch to the brighter yarn, I’m not as confident about the mashup. 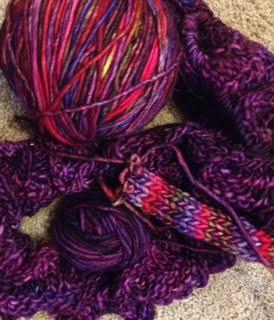 I stopped midrow, grabbed the second yarn, and simply stockinetted till I’d gone through several quick color repeats. In the right light it’s good, even if that bright fuchsia does scream Look at me! I’m still not sure. I think Kathryn hadn’t been entirely either, although she wasn’t going to talk me out of it if I wanted it. My husband says that me not being sure of a color combination is not a good sign for that color combination. And of course colors influence each other, and in the original plan they would have been all over each other, interacting constantly, but now they’re going to be off in their separate corners. Like two-year-olds in parallel play? Okay, these are (the most flattering, frankly, of the) nighttime photos but then the finished thing will be used day and night. So there’s that. The real answer is to just go buy more purple and not fuss any more about it. The real question is, do they have more. At the rate this Pythagorean pattern is eating yardage I’d need (yow) the whole rest of the bag. I debated the wisdom–no, actually, I thought it was an outright rather dumb idea–of taking fluffy blurry yarn to an eye doctor appointment. Those always take several hours so I knew I had to have something, and something smooth and plain on bigger needles than 4mm would have been better and I tried but in the end I just couldn’t make myself have another project going at once and so it talked its way into my knitting bag after all. Because it already had a few rows done. It was a wispy brushed suri alpaca and silk that Fyberspates had given the perfect name of Cumulus to; a skein had grabbed me at Purlescence. I’ve seen the retina specialist just a few times over the years, and yet he remembered me yesterday and particulars about me to my great surprise. I’d always thought he was a really nice guy; this time he just glowed. He was also quite apologetic as he came in and I smiled, No, no, you’re fine! Turns out he has decided to retire. He was taking his time seeing old friends, clearly, not knowing when he might get that chance again. I asked him what he would do in his retirement and he said he’d be continuing to guide residents at the medical school and to see his pediatric patients. And I thought of all the preemies whose sight has been saved because of him, still getting to see him, and it made me so glad for him and them both. The new doctors coming up will be well served too with him still their mentor. He was as thorough and careful as he was when my child was his young patient 22 years ago for a visit or two–and he’s the one who’d cleared his schedule despite his staff having told me no: when there was an emergency he was the one who’d taken over and made everything okay again. He described my macula problem in detail. And then smiled and said he had that too. Way too early, no reason to risk surgery yet. Same with the cataracts, same with the corneas that will need transplanting some day. All in all, a little bit of aging but really, things do look good and should for some time. He took great joy in that, and how could I not too? He laughed at the end when I mentioned that somehow even blurry yarn had worked out there. Another hour or so last night and again today and there you go, I did actually do most of it with my eyes dilated and now it’s done. At knit night tonight I very nearly finished the first hat out of that so-soft Eco Duo. I eyed the bin, my fingers wanting to play with more. And I said to Sandi: You remember putting that note on Facebook about this being on sale this week? And I dashed right in and got some. And then all week long I’ve had the day wrong because, y’know, Purlescence is Thursday. I almost missed tonight because I was sure it was Friday! Can you frame that question better? Amazing how much knitting you can get done in one day when you want to get past the fiddly stuff to the mindless part by knit night time. And I did! I was wrong the other day. It wasn’t rubber from the plate frames, they were plastic, the rubbery grit was maybe road dust? Tire particles, I think. Whatever, still, I tossed the old ones from both cars. Who needs to advertise car dealerships? The lady at the DMV was right: the car does look better with frames around the plates. And so at knit night tonight, I half-jokingly, sure I was being outlandish, asked if they sold any that had, y’know, a knitting theme or something. Sure! Okay if it says I’d rather be knitting above and Purlescence below? Got’em, and Greg went into the storeroom and to get one for someone else at the table and came back with them. Pamela (new employee, old friend): Free, they’re free advertising for the shop. Me: But but but. Thank you! Cool! And then I came home with them. A certain someone grinned, rolled his eyes in great exaggeration, saying, I drive that car, too–and he patiently put up with me. Well hey, I was just opening a discussion here. His and hers. We need to find/have made a ham radio one for you to go with mine for me, right? He’s thinking about what he might like his to say. I think it might be a good idea for me to either take my second one back or find someone else who would really like one too.